The Indian government was in touch with former Bangladesh premier Sheikh Hasina when she was in London after the Awami League leader was banned from returning home by the caretaker military-backed government. Hasina said this shortly after the ban was lifted yesterday within four days after she was stopped from boarding a flight to Dhaka from London. Setting the stage for a major showdown with the White House, the House of Representatives has passed a Democrats-backed war spending bill, which sets a timetable for withdrawal of US troops from Iraq, and the Senate is expected to follow suit. Brushing aside a threat by President George W Bush to veto the bill, the House late last night passed it by a 218-208 vote, which was preceded by mounting rhetoric and even exchange of insults by Democrats and Republicans. Karolos Papoulias, the President of Greece, said today India and Greece would work jointly towards battling the “scourge” of human trafficking. Asked at a joint press briefing for the Indian and Greek media whether the issue came up during his talks with visiting Indian President A.P.J. Abdul Kalam, Papoulias said the two sides would speak on the issue later in the day. A group of researchers led by the University of Tokyo has broken Internet speed record — twice in two days. Operators of the high-speed Internet2 network announced on Tuesday that the researchers on December 30 sent data at 7.67 gigabits per second, using standard communications protocols. 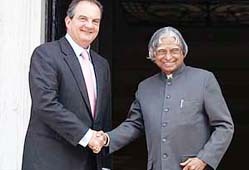 Kalam calls for closer energy ties with Europe. Maoists' protest rocks Nepal Parliament. The Indian government was in touch with former Bangladesh premier Sheikh Hasina when she was in London after the Awami League leader was banned from returning home by the caretaker military-backed government. As she prepared to return home, former Bangladesh Prime Minister Sheikh Hasina has demanded early elections which her Awami League party will fight to establish a secular democracy, rejecting "any kind of extremism". Hasina said this shortly after the ban was lifted yesterday within four days after she was stopped from boarding a flight to Dhaka from London. "India's External Affairs Minister Pranab Mukherjee spoke to me and the Indian High Commissioner Kamalesh Sharma met me here," Hasina, chief of the Awami League, told PTI in an interview here. She did not give further details. Hasina said her party always valued "friendly relations with India and other neighbours." “It is during my regime we signed a 30-year treaty with India for sharing of the Ganges river waters. When we came to power there were 64,000 refugees in India and during my regime we brought back all the refugees." The Awami League chief gave credit to "media and international pressure" for the lifting of the ban. "It is the pressure of the people at home and the role of media at home and abroad that forced them(caretaker government). There was tremendous national and international pressure and because of the pressure they had to withdraw (the ban)," she said. Hasina also said it was her will-power and determination to return to her motherland which prevailed upon the caretaker government to reverse its decision. "They thought I will wilt under pressure but they were mistaken," said Hasina, who had faced a grenade attack on her life and became deaf in her right ear. Setting the stage for a major showdown with the White House, the House of Representatives has passed a Democrats-backed war spending bill, which sets a timetable for withdrawal of US troops from Iraq, and the Senate is expected to follow suit. Brushing aside a threat by President George W Bush to veto the bill, the House late last night passed it by a 218-208 vote, which was preceded by mounting rhetoric and even exchange of insults by Democrats and Republicans. The Senate is also expected to pass the $ 124 billion war spending bill along party lines despite the pleas of the top American military commander in Iraq, Gen David Petraeus, who gave closed door presentations of the ongoing operations in Baghdad to lawmakers until late last evening. Karolos Papoulias, the President of Greece, said today India and Greece would work jointly towards battling the “scourge” of human trafficking. Asked at a joint press briefing for the Indian and Greek media whether the issue came up during his talks with visiting Indian President A.P.J. Abdul Kalam, Papoulias said the two sides would speak on the issue later in the day. He added that “the two countries would make a joint effort to fight against this scourge again humanity”. “Talks on this will proceed on this as well. Any form of human trafficking is a disgrace to society,” said the Greek President. Papoulias’ statement on human trafficking assumes significance in the wake of law enforcement officials in India busting a human trafficking scam that has already led to the arrest of Babubhai Katara, an MP from the BJP, and a nation-wide probe into the suspected involvement of other MPs and Legislative Assembly members. Kalam said India and Greece would work towards increasing bilateral trade to $ one billion by 2010. He said India was working towards economic development and would spend over $ 300 billion on infrastructure development within the decade. A group of researchers led by the University of Tokyo has broken Internet speed record — twice in two days. Operators of the high-speed Internet2 network announced on Tuesday that the researchers on December 30 sent data at 7.67 gigabits per second, using standard communications protocols. The next day, using modified protocols, the team broke the record again by sending data over the same 20,000-mile path at 9.08 Gbps.